The development of the center pivot sprinkler over the past 20 years was an advance in the state of irrigation technology comparable to micro-irrigation, plastic pipe and laser leveling. 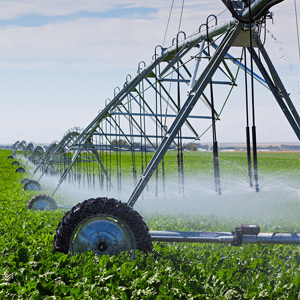 The only thing that has possibly meant more to the practice of irrigation than these would be the wide use of efficient, centrifugal and turbine pumps. The center pivot has opened up thousands of acres to irrigated, agronomic crops and increased production o thousands more. Farms that could not use surface methods because of topography and could not economically justify portable, side-roll or solid set sprinklers had no alternative to dry land agriculture until the advent of the center pivot. The pivot solved the problems of topography, economics, labor and deficient water supplies. Pivots are in use in nearly every country in the world on nearly every crop and the contribution of the pivot to the world’s agriculture cannot be overestimated. However,there are some situations in irrigated agriculture where the pivot will never work. The circular motion of the pivot is the key to much of its success. It is the most efficient path through the field because the machine is continually moving into the driest area. Additionally, the pivot point makes both the alignment and water supply fairly simple. Unfortunately the circular path also produces the physical and biological limitations on the use of the center pivot. The end of the traveling pipeline must move completely around the perimeter of the field during each circuit, and, as the system moves, it must apply sufficient water to satisfy the needs of the crop until the system returns. The fast moving end of the pivot must apply water at a very heavy rate to deliver enough water to the crop as it speeds past. The soil must have an infiltration rate enough to accept the water at the rate applied or the water will run off the field. The critical factors in this situation are the Et, the daily water requirement of the crop that the pivot must supply and the IR, the infiltration rate of the soil. These factors must be in balance for the system to operate succesfully. If the Et and IR do not match, the pivot will either have to apply water too fast for the soil to absorb or, if the application rate is equal to the IR, the system will not be keeping up with the needs of the crop. Problems with center pivots begin to be seen in hot, arid climates with high pH, desert type soils. The hot, dry weather produces a high Et and consequently a high application requirement from the pivot. The desert soils are often characterized by low infiltration rates which compound the problem. There is nothing wrong with the concept of the center pivot even in arid climates and soils. It is only the size of the system that is limited. At some point along the length of any properly designed pivot the machine will be applying exactly the amount required by the crop at exactly the rate that the soil will accept it. This is the maximum length the pivot can be under those conditions. If it is longer than this maximum, the sprinkler heads from this point out will be applying water too rapidly for the soil to absorb it. The maximum length and therefore the area covered by the pivot are determined by the biological limit of the crop’s Et and the physical limitation of the intake rate of the soil. High Et’s and low IR’s require small systems to avoid runoff or water stress. In many arid situations, the maximum size is too small to be economically feasible. Conditions in the mid-west can allow 1,320-ft. pivots plus corner systems to cover nearly all of a quarter section. In the humid south, pivots can be over a half mile in length and cover in excess of 500 acres. In the Central Valley of California, Arizona or parts of Saudi Arabia, the maximum length for some crops may be less than 125 ft., covering only one acre, hardly a practical system.